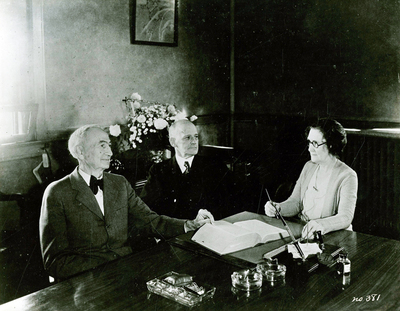 This image shows J.R. Alexander, Henry Cherry and Mattie McLean ca. 1930. Mattie McLean was hired by Cherry in 1906 to be secretary of the new college and the Board of Regents. She had been his right hand since 1902 until his death and continued to work for the presidents of WKU until her retirement in 1945. Ms. McLean passed away in 1954 in Mississippi. McLean Hall is named in her honor.